payment processing and no duplication of effort. 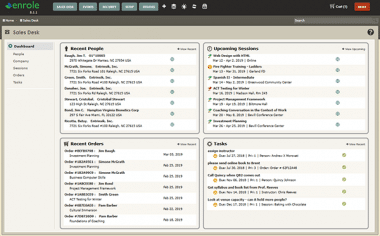 Enrole is a hosted registration and course management system. The staff home page is built with a clear, clickable user interface to easily hyperlink between files containing all registration history, payments, course information, discounts, instructors, and SO much more. Easily set up any type of non-credit offering for online student enrollment and custom training. You will have detailed weekly meetings with your project manager to talk about your business practices and details about how this system works for you. Meetings will continue until after on-site training has occurred, and your department has gone “live”. Your project manager remains at your service throughout your contract. Your students’ ecommerce shopping experience with Enrole is completely simplified and mobile optimized with a mobile-first approach. With our online cart your students will be able to enroll with 5 clicks to checkout and Amazon style upsell. Enrole adheres to the PCI DSS industry standards, and we do not store any card information on our system. The standard version of our shopping cart is also WCAG compliant. Enrole is 100% web-based, there is nothing to download or install and no additional hardware is needed. Your network data is secured at all points with TLS protocol and security certificates to protect data in transit while the latest key managed cryptographic techniques are used to secure data at rest. Data is replicated in real-time to failover servers, backed up daily offsite with a 30-day retention policy, and archived onsite nightly. Entrinsik supports, maintains and upgrades frequently, so you never worry about limited I.T. resources again. Enrole’s results-driven thought process focuses on increasing revenue and enrollment with student self-service registration and user-friendly technology. We incorporate increased efficiencies in time and cost savings to streamline and automate processes to help you grow your business. 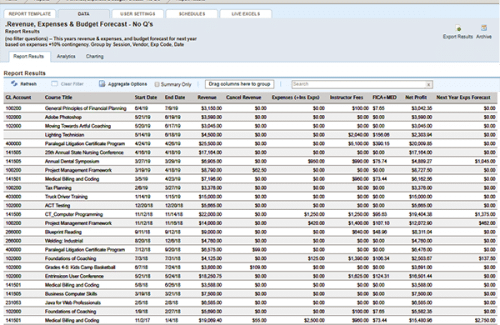 Our software gives you an immediate review of statistical data, and the ability to report on any data in real-time including class fulfillment, financial management and return on investment. Do you feel handcuffed to your Google Docs, papers, or Excel spreadsheets? Enrole is the key to eliminating the need to enter courses and sessions into your system AND your website. 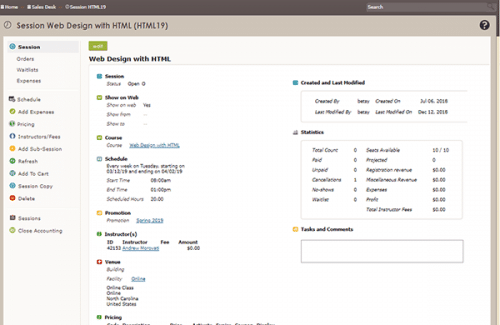 Enrole dynamically updates your shopping cart based on how sessions are set to display and when. No duplication of effort, and no hassle! With mobile-first design, Amazon-style suggestions, and 5 clicks to check-out, it’s easy for your students to enroll in your classes. When you purchase Enrole it includes all portal options available & reporting. Enabling your future growth with no add-ons necessary. We are proud to have a fantastic 100% customer satisfaction rating. We offer unlimited support at no additional cost. Our award-winning reporting tool allows you to edit the bundle or create your own basic to highly complex, analytical reports and visualizations! Maximize productivity and automate the LMS interface for immediate start to learning and daily processes for confirmations and invoices. Three-day on-site training is given to all new customers, which includes everything you need to know and best practices for a quick “go live”. 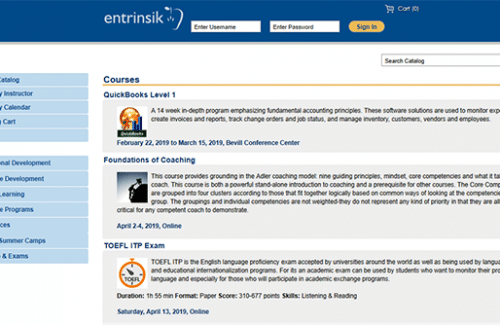 Since 1984, Entrinsik has been specializing in non-credit registration software. Our staff have over 150 years combined experience working in and programming for Continuing Education, so we understand our client’s pain points. Don’t just take our word on how hard we work for our customers, check out what they’re saying. We have used Entrinsik’s Enrole for our non-credit registrations for Professional Development and OLLI for almost a year now. Having gone through an RFP for a registration system just a few years earlier and not being happy, we knew what we did want, didn’t want, and what to ask. During our original implementation of Enrole we were in a time crunch, within 3 weeks we were trained and had completed implementation. We have found Enrole user friendly for both ourselves and our customers. The staff at Entrinsik are perhaps their greatest asset. They are knowledgeable and always willing to answer questions. Want to learn more about Enrole?